This 6" Buckeye Beauty quilt block pattern was used for a previous Quilting Forum event. Follow the guidelines to make the same types of blocks our forum members exchanged with each other, or mix up the colors in any way you like. The 6" quilt blocks are beginner friendly. The design has been called many names over the years so don't be surprised if you run into the blocks labeled in another way. A color wheel can help you decide which colors might look perfect when combined to make the quilt blocks. You'll see one example of an entirely different look for the block in my Jewel Box quilt pattern. The instructions explain how to make coordinated pairs of Buckeye Beauty quilt blocks. Sew the first with a purple diagonal path and green corners. Make a second by using green in the diagonal pathways and purple in the corner half-square triangle units. To make a larger version of the quilt block, take a look at my 10" Buckeye Beauty quilt block pattern. Each piece of fabric in 6" Buckeye Beauty quilt blocks is relatively small, so avoid large-scale prints, which often look very different from one area to another, and detract from a block's color scheme. Portions of the quilt block are assembled with quick pieced half square triangle units, popular components that can be constructed in many ways. Cutting instructions are suitable for the method linked in the instructions, which pair the 3-7/8" squares. Alter cutting to use another method. If this is your first experience with the units, cut your squares slightly oversize, and then trim them back to the required 3-1/2" x 3-1/2" before sewing them into the block. Trim-back instructions. 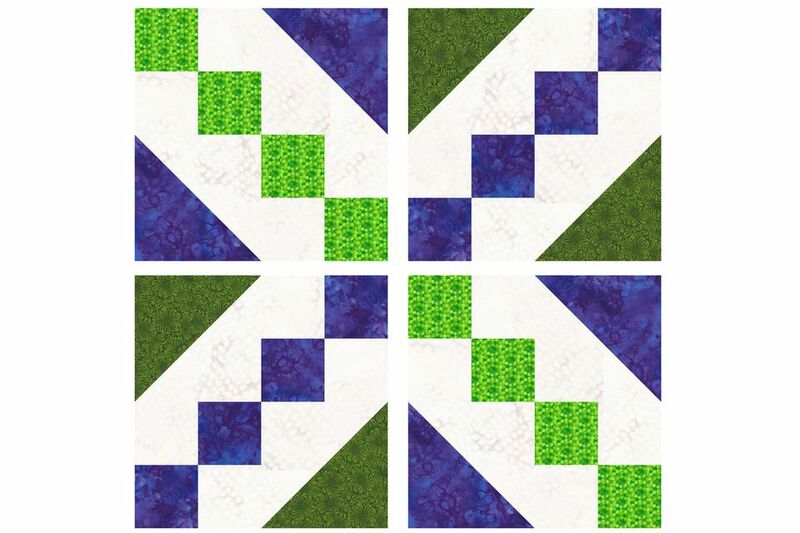 Assemble the second quilt block in the same way, but cut the fabric as follows in order to switch the positions of green and purple in the finished block. Follow the illustrations from left to right in the top and bottom rows. Use the quick pieced half square triangle method to create two half-square triangle units by sewing two diagonal seams to connect the 3-7/8" WoW and purple squares. Each completed unit should measure 3-1/2" x 3-1/2". Use a quarter inch seam allowance to sew a 2" x 9" WoW strip lengthwise to the green strip of the same size. Press to set the seam and then press the seam allowance towards the darker strip. Each strip should be 1-3/4" wide along its entire length. Square up one end of the strip set. Cut four 2" segments from the set. Use the segments to create two four-patch units, placing like colors on the diagonal in each. Press the center seam allowance in each four patch in either direction or fan the seam out from its center to reduce bulk. Create two rows as shown, bottom left. Sew the components of each row together. Press seam allowances towards the four patches. The quilt block should measure 6-1/2" x 6-1/2". Repeat the process to make the coordinating block. The half square triangle units will be green and WoW and the strip set and its segments will be purple and Wow.